Former President George W. Bush and U2 lead singer Bono at Bush’s ranch in Crawford, Texas, on May 26, 2017. Lead U2 singer Bono made a pit stop Friday at former President George W. Bush’s ranch in Crawford, Texas, a few hours before his band’s sold-out concert in nearby Richardson. Both men have been active in efforts to end the AIDS epidemic in Africa. Bush created PEPFAR, the U.S. President’s Emergency Plan for AIDS Relief, while Bono co-founded ONE, a global campaign and advocacy organization that rallies around AIDS awareness and anti-poverty initiatives. So, there you have it, an Irish singer who railed against the indignities and atrocities leveled upon his people by the Brits, cozying up with a war criminal more horrific than any British leader! Yes, nice of Junior Bush to finally show some decency for others in need. Yes, nice enough for Bono to put his time (and hopefully his riches) in the work he is doing for those same folks in need. I forget, did Junior Bush serve time (if not being executed) for his war crimes? Did Bono have a memory lapse and forget what transpired and still resonates with the creation of ISIL and other crazy fanatical groups? You see, this Bono/Bush Jr. collaboration is indicative of how mass apathy and mass amnesia operates. 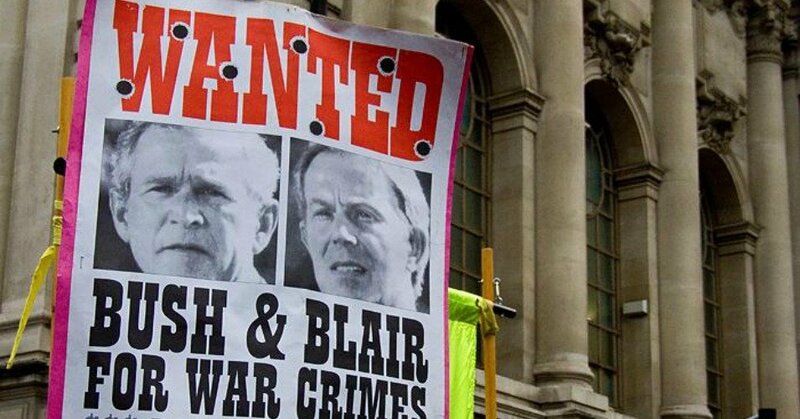 We have seas of so called journalists who for years have only criticized the 2003 attack on Iraq not for that action- rather how the subsequent occupation was handled or ‘bungled’. So what they did, and what Bono has been doing, is in fact giving legitimacy to the ‘War on Iraq’. This is similar to the recent Trump administration’s missile attack on Syria. Since no Russians were killed, and since it did not start WW3, well, it was OK. The illegal and immoral aspect of attacking another sovereign nation, without even the backing of the United Nations, becomes acceptable. Might makes right! Featured image is from Instagram.